I tied it using some very nice wool I bought at Rhinebeck ’09, in squares that were six to eight inches apart. The ties disappear into the quilt in all but a few places (you can make them out in the solid red spaces). Unfortunately, it is sitting on top of a pile of other quilts I don’t use (eep). That’s not to say I’m not happy I made it: it’s soft and I really enjoyed the process! But it’s a useless size, at about 50″ by 55″. Fine for a newborn baby, but I’m not a newborn baby. I know the clear solution here is to give it to my friend who is about to have twins, but I have already started a zigzag quilt for her (in addition to the courthouse steps quilt I’ve already made), so I’m plowing through. But I don’t know. Maybe I should just give it to her. Anyway, on that note, I’ve been going through all of my stuff because I’m moving, and I’ve discovered that I’ve fallen into a trap that I dreaded falling into: never using or wearing anything I make (yes, I hear your collective gasp and the choir of angels weeping). I gave every garment I’ve made except two to charity. My finished quilts are in a pile on my shelf, and I do not feel compelled to finish the tops I’ve made. The one thing I use most often is my sewing apron, which I made in a couple of hours last month out of some leftover fabric and which, of course, I’ve never photographed. So I need to ask: Does this happen to anyone else? Do y’all use what you make? Do you like what you make when you’re finished, or do you stand back and wonder why you spent so much time and money on it? I’m wondering how common this is…and if it fades with experience, or if it’s just a personality flaw of mine. P.S. Please check out Molly’s burdastyle page, where she posted photos of the absolutely gorgeous skirt she made with the fabric she won from me. P.P.S. 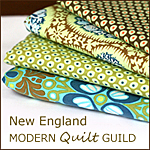 If you want some other “quilty goodness” (a lot of people use this term, so much so that I think it has been incorporated into our vernacular), I posted on the NEMQG blog about our trip to the Lowell Quilt Festival! I have got plenty of quilts sitting on a shelf in the basement unused. I have found that over my 18 years of quilting, my tastes have dramatically changed and I just plain old don’t like some of my quilts! But some of them have made it up to the basket in the living room to cuddle up in when it’s cold outside. Also, I mainly use my quilts as decorations and our house is so small there’s not a lot of wall space to put my bigger ones up on. So now I mainly make wall hangings, which I switch out with the seasons, and the occasional baby quilt as a gift. I am making a queen size zig zag quilt right now for our bed, so that will definitely get used. So in answer to your question, I think it’s completely normal to have unused quilts. Either that or you and I are both a little odd!! oh heck yes. I donate tops regularly. In fact, I donated my very first quilt top! I have a friend who takes tops and gets them longarmed and then she binds them and gives them to dialysis patients at a local hospital. And then I had two finished quilts I wasn’t in love with that I brought down to hospice. And!!! I had a lady who didn’t like a custom baby quilt I made her so I donated it to the preemie baby intensive care area at the hospital…one of the ladies I work with does it a few times a year with her 4H girls too! There is NOTHING wrong with having projects move on to a better life. I’m not into clutter or keeping things around that I don’t use so I give stuff away all the time! You might just be a process sew-er, where you genuinely like the process and aren’t into keeping stuff…I’m like that a LOT! This quilt is great ! Why don’t you sell what you don’t want to keep for you ? IF I ever actually finished a craft I might feel the same way, but at this point I think I’ll be dead before I even finish my first quilt. That probably doesn’t make you feel any better.